Campany, D, et al (2002), Black Dog Publishing Ltd, London. I hadn’t heard of Karen Knorr until my husband brought to my attention a short piece in one of our photography magazines because he thought this was about one of the staff of OCA. However, she is Professor of Photography at the University of the Creative Arts in Farnham and had won the Pilar Citoler International Prize for Contemporary Photography (and 15,00 Euros). The photograph which won the prize, ‘Flight to Freedom’ was one of a series of pictures featuring animals in northern India. I live near to Farnham (in Surrey) and had originally looked at the Farnham University website when I was thinking of doing a photography course. Out of curiosity, I decided to look up the information about Karen Knorr , both on the University website and her own (http://www.karenknorr.com/about/). Her photography looked very interesting and I ordered a book from Amazon. I have been intending to record my thoughts on the book for a few months now and a visit yesterday to the Degree Exhibition at Farnham University has prompted me. There are three main sections in the book which are preceded by a scholarly overview from one of the three authors. In the first section Antonio Guzman begins with an analysis of the Connoisseurs series of photographs (1986-1989) which he believes marks the distinction between the origins of Knorr’s work and her approach today. In Connoisseurs she, ”….abandons the abstract formalism of black and white photography and undertakes the exclusive practice of colour” (p.9), with a further change of format and object. The square format replaces the rectangular and the work is referenced to painting rather than printed photography of published image. Overall, the phraseology is reverential in tone and I have to admit that, at this stage of my photographic journey, I found it rather hard to read. I still do! I’m not going to describe all of them, just the ones which particularly struck me and where possible will give links. Depicts two men in a salon/gallery, surrounded by ornate pictures and looking at them through telescopes. to me this is about the scrutiny of works of art, putting them under the microscope to determine their constituents and meanings. It also reminded me of how often photographers (meaning me!) go round with their camera in front of their noses when they are surrounded by beautiful scenes which are just waiting to be absorbed. 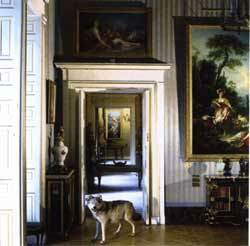 There is also a whole series of images which include stuffed animals in stately houses as if they are visitors. Is this a comment on the way we preserve our art treasures but ignore endangered species? Having looked at the book again, I still find the commentary almost akin to hagiography and, in many respects, it makes me feel distanced from the images. However, the photographs are beautifully presented and some of them are of ‘ordinary’ subjects, such as dogs. Karen Knoor obviously has the prestige which enables her to set up the artistic images in stately surroundings and it was interesting for me to note yesterday, her other working environment – a suburban University in a small town in Surrey. 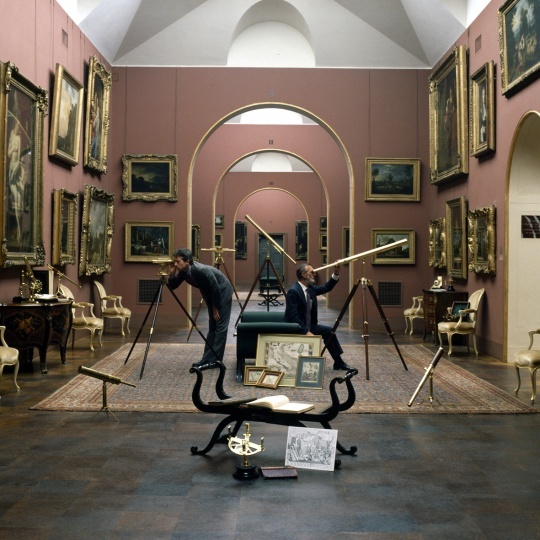 Campany, D, et al , genii loci – The Photographic Work of Karen Knorr 2002, Black Dog Publishing Ltd, London.